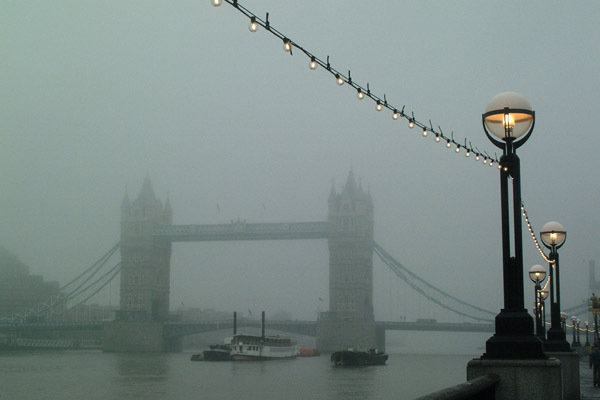 As a Londoner, walking in the early hours along the streets of my city this time of the year is sheer delight, why, I am walking through fog for the last few weeks and how gorgeous! No I am not mad, I really, really love it! And the above song is what I hum all the way to work. One evening after work, when I had this insatiable urge to watch a film, I took the 277 bus to Canary Wharf where my local cinema is, and I could swear I couldnt see any of the buildings. I can usually see them standing proud from Mile End, but that evening it just wasnt there. The fog enveloped them all. If only the part where it says in the ditty, “but the age of miracles hadn’t past, for suddenly, I saw you there and through foggy London town, the sun was shining everywhere” truly happened at least one of these days, or evenings, now that would have been SOME foggy day. for who???? eeeek!!! i don’t think i should ask. Never mind who, mind your own business will you?! Gotta tell you sis, seeing Damian, Gerry or James coming out of a foggy day will surely be your best memory of the city!